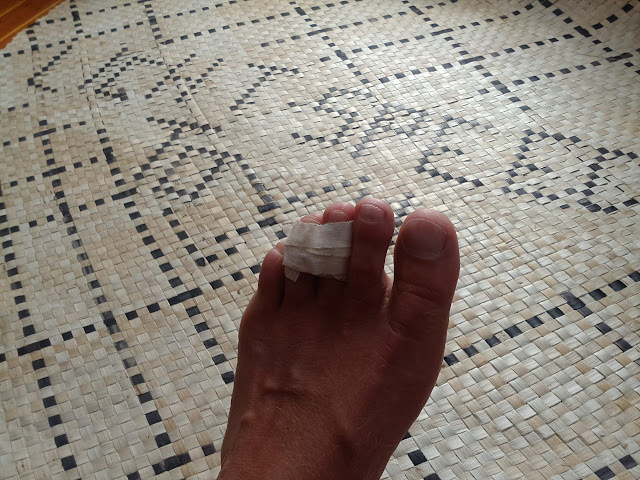 Sailing Adventures of David & Kathy: Broken toe, Hibiscus festival, great sailing and haul out plans. Broken toe, Hibiscus festival, great sailing and haul out plans. We had a great sail yesterday making quick work of the 45 nautical miles sail from Ono island to Levu passage on Viti Levu, Fiji. The first 15 miles behind the reed and then 30 open ocean miles lying between Suva and the Great Astrolabe reef that surrounds Ono and Kadavu islands. The winds were light out of the east around 10 knots and with a northerly course we were able to bring the apparent wind to 60 apparent and achieve boat speeds between 7-9 knots in flat sea. Idyllic sailing conditions. As we approached Suva harbor the wind clocked a bit and gradually shifted SE allowing us to sail through Levu passage, across Suva harbor and right up to the Royal Suva Yacht Club. Just outside the anchored and moored yachts we headed up to drop sail. All was going smoothly until a main sheet traveller line got caught between my toes. As I kicked the line off my foot I inadvertently kicked the edge of the cockpit seriously bloodying a toe in the process. Uttering some colourful sailor expressions we flaked the main sail and anchored the boat. I threw a band-aid on my toe and we jumped in the dinghy heading to shore hoping to catch a few shops before they closed for the day. Our shopping venture was unsuccessful as the Yacht Shop closes at noon on Saturdays, but we did stumble upon the Hibiscus Festival going full swing at Albert park. It's a week long event with a carnival, food stalls and tons of live entertainment. Since we were getting hungry, this was a great find and we sampled many of the offerings of the 50+ food vendors. The carnival rides included none less than 8 Ferris wheel, so you pretty quickly get the idea this is a huge event, maybe the biggest event of the year for Suva. A taxi driver told us the entertainment runs 24 a day until next Saturday at midnight. That's a lot of partying! Most of the meals were F$5-$7. Tasty deep fried potato curls. Fight NCD'S? That's Non-Communicable Diseases like diabetes, obesity and heart deseas by eating right. Snacking on some tasty deep fried vegetarian Indian food. Yumm. Fijian ladies taking a break on a Fijian mat. Putting your kids in these tin space ships of death would not be mom approved in the USA. Dave throws away F$2 on a chance to wind F$60 at an unattainable goal of knocking over empty tin cans. Kathy wins a 2nd shelf prize at the roll a ping pong ball game. Trying to get this Ferris wheel up and running. Check out the truck rear axle with the levers that alternatley engage the old brake drums. Pretty ingenious just as long as no small kids get caught in the cables and sliced in half. Round and round they go. When it breaks and you fly to your death no one knows. It's more than fifty years old, gas powered and has a leather belt drive that's ready to maim the operator at any moment.. Ethnic Indian Fijian family is all smiles. Ferris wheel for F$2. Just hope a gust of wind doesn't blow the whole show over. Safety not first on all the carnival rides. Now that's a beautiful and unique laptop case. Bula Coffee. We like to buy local and were excited to find a new Fiji based start up Coffee company. www.Bulacoffee.com.fj it's available in a few shops around Fiji, but for the latest on where to buy and best prices you should contact Luke Fryett at e.hello@bulaacoffee.com.fj. My toe was definitely not right, but it wasn't until I got in bed last night that it really started to throb. This morning it hurts worse to walk, it's black and blue and now 'buddy taped' to the next biggest toe for the next 4-6 weeks to heal. My toe and our LightSpeed mat from Tovu (Toe-vu). On Monday we hope to haul LightSpeed out of the water on a +1.8 meter high tide here at the Royal Suva Yacht Club slipway. Nothing serious, just maintenance like disassembling the sail drives and replacing the shaft seals, renewing the coatings on the Yanmar SD20 saildrives, painting the bottom with anti-fouling paint and waxing the hulls. We have almost exactly three years to the day and I'd guess over 10,000nm on our antifouling paint. It's International Ultra hard anti-fouling and we're putting the same on again. The paint is pretty hard so you can scrub the bottom without losing too much paint in the process, plus it doesn't wear off at higher sailing speeds like a self polishing ablative paint would. For the saildrives I will be stripping them to bare bright metal with a 36 grit paper to provide a nice mechanical key for the four coats of Interprotect 2000E to be followed by 3 coats of International Trilux anti-fouling which is suitable for the alloy saildrives.